Canadian super twins Cailli and Sam sit down and talk all things New York Fashion Week and being one of the most creative bloggers we ever met. The Editor-in-Chief at Refinery29 sits down with us and shares a few lessons on life, NYC Fashion, and her secrets to success. 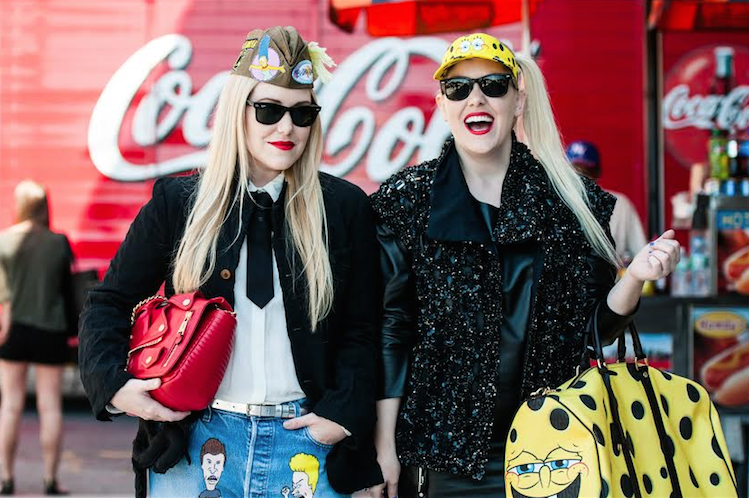 Canadian twins Cailli and Sam Beckerman have made a huge impact on the blogging world with their quirky more-is-more style. After prestigious internships with renowned labels like Oscar de la Renta, the girls have become a brand on their own due to their large digital impact. We sat down with the exuberant girls and asked about their style, their inspiration, and of course, their adorable dogs. We are twin bloggers, Cailli and Sam Beckerman from BeckermanBlog.com and have had our blog for almost six years. Where are you from and where do you call home? We both are obsessed with Santorini in Greece because of how beautiful it is and how the whole city is blue and white! It looks like it's right out of a calendar! And DisneyWorld!!! When traveling, what are your top 3 travel must-haves? Your story is unique, because your blog fame came as a result of your time at FIT. How important do you think education is for success in the fashion world? I think having a background in Design and Accessories Design was important when we were designers doing our line. Our education at F.I.T was an important ingredient for us and we use it everyday in blogging. How did internships with Oscar de la Renta, Marc by Marc Jacobs, and other high fashion brands influence, impact your feelings about the fashion industry? I think interning was probably one of the best ways to learn about the fashion industry. We both worked hard and had a lot of fun running around. We were always documenting our outfits, travels, favorite fabrics, scrapbooking as well as doing lots of videos. We just needed somewhere to put it and decided to start a blog! What would you say are your personal style essentials, and why? Definitely a plaid shirt ripped jeans and a leather jacket. And for makeup, a red lip and black pinup eyeliner. We love rock 'n roll and hip hop. We always mix it up with DIY accessories and Chanel. If you weren’t in the fashion world, what would you be doing instead? Why? We would probably both be veterinarians. We are animal lovers! Who are your favorite designers at the moment? Why? We have a lot of favorite designers like Chanel, Christopher Kane, Coach, Ashish, H&M, Moschino, Marc Jacobs, Jeremy Scott, Marques Almeida, Rodarte, Gelareh Mizrahi, Comme des Garcons, and vintage We love each designer and the spirit that their collections embody! You have two fashionable pomeranians, one of which you even named after one of Marni's collections. Please tell us a little about your dogs and their fashion inclinations. Marni and Cubby love to get dressed up! They both love to get dressed up as much as we do and we have a lot of fun together doing lots of videos! Marni sits on the carpet and barks at us to dress her up! You girls are always accessorized to the fullest. What's your style method for acquiring and styling accessories? We are obsessed with accessories! And honestly think that the more accessories...the better! we have a pretty big collection because we collect them from all over! We also hunt things down! Fashion is clearly a large part of your lives. What's coming next from the Beckermans in the future? We are gonna keep on blogging and having fun traveling the globe as well as traveling and covering fashion week and doing lots of awesome collaborations on the blog! Your style has experimented with everything from cornrows to Spongebob. What is your fashion philosophy? Do what makes you happy, follow your dreams and have fun doing it! What shows are you most anticipating this time around at NYFW? Rodarte, Jeremy Scott, Marc Jacobs and Coach! What do you love about being in the city for NYFW? How the city is full of energy during NYFW and the excitement of all of it!